Sugar free jam tarts are, in fact, the most basic way of cooking with sugar free jam but they are nevertheless extremely tasty.Sugar free jam is often sweetened naturally with apple or grape juice so it works fantastically in recipes where you are trying to avoid the use of sugar. As they are so easy to make, this is a recipe that works well for parents looking to bake with small children or for older youngsters who are just beginning to cook alone. The key to the success of the recipe is to find some good sugar free jams. Experiment a little with different varieties to find the flavour and textures that you like. When baking sugar free jam tarts for youngsters to eat or as a cupboard supply for lunchboxes etc, use a bun tin and make individual small jam tarts.You could also, however, line a larger tart in and make one large version that could be served with cream and fresh fruit at a dinner party. You could embellish your jam tart or tarts by putting small cubes of fresh fruit under the jam before baking. Try pieces of pineapple, fresh strawberry, banana or blueberries. Allow these to cool before eating and serve them with a generous helping of sugar free ice-cream. Use this very simple recipe for making pastry when baking any jam tarts. One of the tricks to ensuring it works well is to make sure you leave it in the fridge for a good hour to firm up. Place your soft margarine in a medium bowl and gently fork in one tbs plain flour and one tbs cold water. Mix with your fork until you have a paste. Slowly add the rest of your flour until you have a pastry-like dough. Wrap in cling film and place in the fridge to chill for about an hour. This is the easy bit! Just try to make sure you don’t burn your jam. Also, remember that jam tarts are extremely hot when they come out of the oven and should always be left to cool before being eaten. Varieties of sugar free jam that work well in this recipe include strawberry, blackcurrant, apricot and raspberry. If you really want to have fun then buy a selection and have tarts in every colour! Preheat your oven to 200 deg C/400 deg F/gas mark 6. Grease a couple of bun tins. Roll out your pastry on a lightly floured surface. Take a round cooker cutter and cut circles from your pastry. Pop them into the holes in your tin and press down gently. 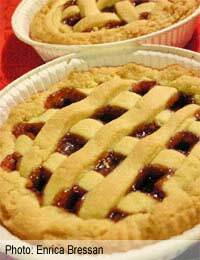 Put just one tsp of jam into each pastry case. Bake for about 15 or 20 minutes or until your pastry is crusty and golden brown and the jam is bubbling away inside.